PLUS AUTO-LUBRICATION SYSTEM (to make lubricating your treadmill easy and quick) + HYDRAULIC SOFT-DROP SYSTEM (set up and pack away with ease). Delivery cost includes England, Wales & Lower Scotland only – call for delivery costs to IV, KW, UK Islands + N Ireland. EXCLUSIVE to Salus Sports the X-LITE AUTO treadmill is a stylish contemporary design that’s easy-to-use. 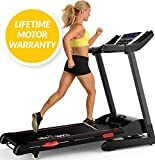 The practical design features + affordable price makes the X-LITE AUTO superior to similar treadmills on the market. All this plus a LIFETIME motor warranty + 2 YEAR warranty on frame + parts to give you peace of mind. Monitor your speed, incline, time, distance, body fat, calories + heart rate at the touch of a button. Select from 8 Quick Start buttons or choose one of the 12 interval training programs to get you moving quickly. The pulse sensors allow you to monitor your heart rate easily. The X-LITE AUTO’s specially designed hand controls allow you total control of your workouts for maximum results. Increase the intensity of your workout + achieve your fitness goals faster by adding incline to your workout. The extra-wide running surface gives you the space + confidence you need to exercise comfortably. The distinctive grip + 6 high impact cushioning points are not only stylish but are also designed to reduce bounce offering a soft landing and firmer push-off reducing the impact on your joints. The soft drop hydraulic system allows you to set up and pack up with ease. Lubricating your running belt couldn’t be easier with the auto-lubrication system designed specifically for the X-LITE AUTO – EXCLUSIVE to Salus Sports.